Houston Systems Manufacturing Company, Houston, Texas, has completed the fabrication and rig-up of a workover/drilling platform rig for the Hercules Offshore Drilling Company, two trailerized desert rigs for USS Oilwell Supply and one mobile workover rig for Cooper Manufacturing Company. Each rig was a custom job and has been rigged-up to meet unique working conditions. The Hercules rig was built by HSMC/ Rig-Up Services for operation on limited space platforms in the Gulf of Mexico. Utilizing a HSMC 450,000-pound telescoping mast and 1,000-hp Gardner Denver drawworks, the rig is designed for a working depth of 12,000 feet and to breakdown into 20,000-pound maximum loads for easy rigup/ rig-down. This is the third of this rig type HSMC has produced for Hercules. The Oilwell rigs also represent the latest in specialized drilling technology. Destined for the oil fields of Abu Dhabi to work for ADMASCO, these two desert rigs are rated to a depth of 9,000 feet and have been trailerized with oversized desert tires and skid-mounted mud systems. These are the fifth and sixth rigs HSMC/Rig-Up Services has built for USS Oilwell in 1982. The first two were 9,000-foot geothermal rigs which featured a unique mud cooling tower designed and fabricated by HSMC. Bound for Indonesia, they will drill for Pertamina, the national oil company. The other two, also for ADMASCO, were the 12,000-foot big brothers of the desert rigs currently under completion. 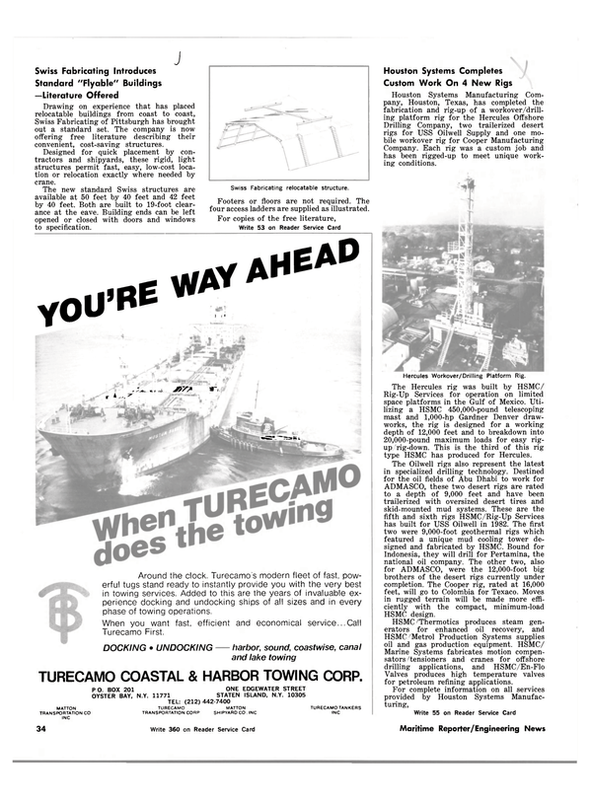 The Cooper rig, rated at 16,000 feet, will go to Colombia for Texaco. Moves in rugged terrain will be made more efficiently with the compact, minimum-load HSMC design. HSMC /Thermotics produces steam generators for enhanced oil recovery, and HSMC/Metrol Production Systems supplies oil and gas production equipment. HSMC/ Marine Systems fabricates motion compensators/ tensioners and cranes for offshore drilling applications, and HSMC/En-Flo Valves produces high temperature valves for petroleum refining applications.